A police officer directs pedestrians near the site of one of the mass shootings at two mosques in Christchurch, New Zealand, on Saturday, March 16. After the New Zealand massacre was broadcast live on Facebook, it quickly went viral on various social media platforms. Companies including Facebook, Twitter and YouTube scrambled to take it down, but once something goes viral on social media, it's difficult to stop its spread. And that has been raising questions about live broadcasting on social media and who should have access to it. The alleged shooter seems to have first advertised the attack on the online forum 8chan, a message board known for right-wing extremist users. He included a link to a Facebook account. That Facebook account is where a 17-minute video was livestreamed in real time. The video starts behind the wheel of a car. It appears to come from a body-mounted camera. 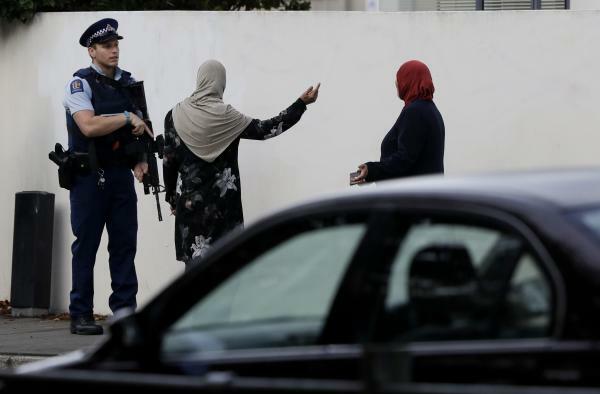 The alleged shooter pulls up to Al Noor Mosque, one of two mosques attacked in Christchurch, New Zealand. And what comes next is sheer horror. He starts shooting worshippers. At one point, he returns to his car for another gun. Then he shoots people who are quite close to him. Professor Alex London teaches ethics and philosophy at Carnegie Mellon University. He says the viral nature of social media livestreaming makes it an ideal tool for extremist groups to spread their message. "When your point is to strike fear into the hearts of people, livestreaming allows you to carry your message much farther," London said. But that same technology and social media access also allow people to call out things like police brutality. For example, London said that it used to be that when people would accuse police officers of abuse, "you'd have to believe their testimony." Now, livestreaming provides more solid evidence in some cases. Perhaps that's why, when Philando Castile was shot by a Minnesota police officer, his girlfriend's first instinct was to start broadcasting live on Facebook. The video went viral, causing national outrage. "It gives people a much better sense of the event, and the event in real time," London said. But as much as livestreaming can document, it can also prop up atrocities and make them go viral, as in the case of the New Zealand shooting. This is hardly the first time the role of social media in these types of attacks has been highlighted. Last year, before an alleged armed shooter opened fire on a synagogue in Pennsylvania, he first posted hate speech on the fringe message board Gab, which has been accused of harboring extremist viewpoints. A Florida man accused of sending pipe bombs to various politicians across the United States had a history of threatening people on Twitter. And over the past year, Facebook has come under intense scrutiny for allowing hate groups on all its platforms, including WhatsApp and Instagram. Recently, Facebook CEO Mark Zuckerberg announced that he was adding more moderators to crack down on disturbing content. Katie Moussouris, a cybersecurity expert, is advocating that social media companies crack down on the ability by anyone in the public to livestream. "It's not a bad idea to potentially have only verified accounts allowed to post. And if something that they post that is livestreamed does contain violence or hate speech, that privilege goes away," Moussouris said. Professor Al Tompkins, who teaches ethics at the Poynter Institute, said free speech should be taken into account when considering the reaction to these tragedies. "Look, here's the thing about free speech and free expression: It's a messy proposition, and there's always going to be abuse," he said. "It's true offline. It's true online." Twitter and YouTube have both condemned the attacks and said they are working to bring down any video of the shooting. Facebook said in a statement that it moved quickly to take down the shooter's Facebook and Instagram accounts, as well as the video. It also said it is removing any praise or support for the crime and shooter. The alleged gunman streamed his attack live on Facebook. Then the video went viral. Facebook, Twitter and YouTube are still scrambling to take it down. NPR's Jasmine Garsd has been digging into that aspect of the story. JASMINE GARSD, BYLINE: The alleged shooter seems to have first advertised the attack on the online forum 8chan, a message board known for right-wing extremist users. He included a link to a Facebook account. That Facebook account is where a 17-minute long video was livestreamed in real-time. The video starts behind the wheel of a car. It appears to come from a body-mounted camera. He pulls up to Al Noor Mosque. That was one of the two mosques that were attacked. And what comes next is sheer horror. He starts shooting worshippers - at one point, going back to his car for another gun. Then he proceeds to shoot people at short range. Facebook took down the video after it happened, but it was too late. It had already gone viral on YouTube and Twitter. The social media platforms had lost control. And this raises a lot of questions about live broadcasting. ALEX LONDON: When your point is to strike fear into the hearts of people, livestreaming allows you to broadcast your message much farther. LONDON: When people would say, you know, the government is perpetrating acts of violence or the police were abusive, you'd have to believe their testimony. GARSD: Perhaps that's why when Philando Castile was shot by a Minnesota police officer, his girlfriend's first instinct was to start broadcasting live. That went viral, causing national outrage. LONDON: It gives people a much better sense of, you know, of the event and the event in real time. GARSD: But as much as livestreaming can document brutality, it can also make atrocities go viral and impossible to control, like in the New Zealand shooting. In the last year, Facebook has come under intense scrutiny over allowing hate groups on its platform. Recently, CEO Mark Zuckerberg announced that he was adding more moderators to crack down on disturbing content. Katie Moussouris is a cybersecurity expert, and she says perhaps we should consider the possibility that not everyone should be able to livestream. KATIE MOUSSOURIS: It's not a bad idea to potentially have only specific verified accounts allowed to post. And if something that they post that is livestreamed does contain violence or hate speech, that that privilege goes away. GARSD: But she understands that's going to cause a lot of controversy about who is allowed freedom of speech. AL TOMPKINS: Look, here's the thing about free speech and free expression. It's a messy proposition. And there's always going to be abuse. GARSD: Al Tompkins is a senior faculty at the Poynter Institute. He teaches ethics. TOMPKINS: It's true offline. It's true online. And if you intend to give people the ability to communicate freely with each other, it's going to be messy. And some people are going to abuse it, but most people won't. GARSD: Twitter and YouTube have both condemned the attacks and said they are working to bring down any video of the shooting. Facebook said in a statement it moved quickly to take down the shooter's Facebook and Instagram accounts and the video. It also said it is, quote, "removing any praise or support for the crime and the shooter or shooters." Jasmine Garsd, NPR News, New York. Transcript provided by NPR, Copyright NPR.